A wonderful oil portrait of John McCabe has been made public in January 2017 by the artist and sculptor, Angela Palmer, who is based in England near the beautiful Wye Valley. Angela (not to be confused with the Scottish-born artist of the same name) was a relation by marriage of John McCabe, but sadly lost her husband in a tragic climbing accident some years ago. Nevertheless, always enjoying Angela’s generosity of outlook and spontaneous vitality, John’s relationship with her continued and she made a charcoal drawing of him during a visit to her house prior to John’s 70th birthday. It was from this drawing that Angela has since created the oil painting. 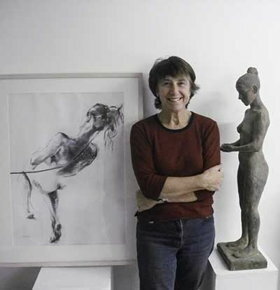 Angela Palmer, who works in sculpture, clay modelling, drawing and painting, has a particular love of life drawing. ‘It is essential to my art, and has become a passion, as is my love of colour, which leads me into painting’, she says, going on to speak of the intense concentration on line and form which is involved in life drawing, as well as of picking up signals from the body, and the response of one human to another. Her oil painting superbly captures not just the appearance, but also the character of John, and it is a happy circumstance that the portrait shows very clearly the strong musculature of John’s left hand, which was so sadly affected by his illness. Further examples of Angela Palmer’s art may be seen on her website www.angelapalmerart.com, where she may also be heard, together with one of her regular life models, talking in a radio interview about her work. 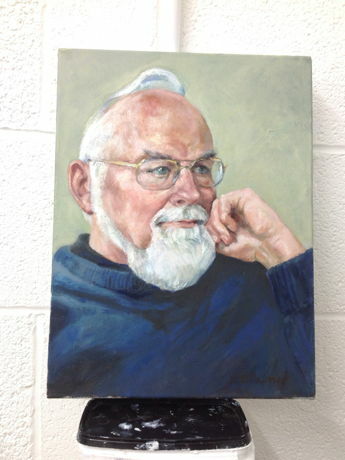 Angela Palmer’s portrait of John McCabe is © Angela Palmer, and if reproduced, should be credited and copyrighted to her.